Addis Abeba, November 19/2019 – It has now become evident that the country has been buzzing with the various changes. Many developments which were unthinkable when viewed with the country’s past political lens are happening within days and weeks with nearly a speed of light. Despite these avalanche of changes, however, there have been, and continued to be, some chilling news of conflicts and violence in many parts of the country that have made it to various media outlets and the social media. In this commentary I will reflect on a recent such conflict that happened in Hawassa, the capital of the SNNPRS, and its environs for reasons I will briefly explain below. Hawassa is my home town, all my parents and grandparents and their great grandparents are from Hawassa and its immediate environs. I have seen Hawassa grow; I have seen it peacefully accommodating and nestling all Ethiopians. As I grew up I have valuable friends from all ethnic groups. I cannot dispassionately disengage when realities are being distorted and disfigured by people with various interests and who hardly know or care less to know the history of the city and its people. Secondly, Sidama and the city of Hawassa has been my professional research area and I have had the privilege of closely studying the various political, economic, sociological, historical and psychological dynamics of the people and the city. I narrate this because it gives a perspective to a reader. Thus, it is incumbent on me to reflect on what I know about the city and its people. The Sidama people, mainly the Hawella clan and other clans essentially under the umbrella of the Hawella clan, lived in Hawassa (Adaree) and its environs. A common cultural knowledge among the Sidama is that, a certain territory is under the auspices of a certain clan and that clan takes primacy in ritual blessings and other important issues. They considered the Tikur Wuha River as their ethnic boundary, crossing it to perform the Luwa age-grade initiation rite. Some elder informants say that at a big tree near the river the initiates discarded their bracelets made from the skin of a cow or sheep (enjicha– it indicates that the initiates are at a certain stage of their Luwa initiation). In 1957 (1949 Ethiopian calendar [EC]), with Ras Mengesha Seyoum at the head of the Sidamo Governorate General (Sidamo Teklay Gizat), Emperor Haile Selassie became greatly interested in establishing a new town in the area where the city is now located. The area appealed to the emperor on many levels. It was located on the important Addis Abeba– Moyale (Kenya) highway; its flat, expansive topography was conducive to city building; and the nearby tourist attractions of Lake Hawassa and the Dume hill (later named Tabor) provided a dramatic backdrop to the area. This prime combination of physical attributes and convenient location led to the transformation of Hawassa from a scattered settlement and grazing land for the Sidama agro-pastoralists to a booming urban center and later to its current role as the capital of the SNNPRS. In 1958/1959 (1950/1951 EC), upon the order of the emperor, a seasonal palace for him was built along Lake Hawassa in an area called Kutuwa. The building of the palace intensified interest in the area among many people, most notably the empress herself proceeded to lay claim to extensive hectares of land in the name of the emperor. As the town grew, more than three thousand people who were living in the area were displaced. Dubale (2010) also notes that a political dispute accompanied the displacement of the Sidama from the Hawassa area. Governor Ras Mengesha Seyoum (r.1955–1960) enthusiastically supported the urbanization of the area, regardless of its impact on the Sidama who had been living there, while succeeding Governor Ras Andargachew Mesay (r. 1960–1965) was much more concerned with the impact of this displacement on the Sidama people. Ras Andargachew Mesay refused to endorse the implementation of a large mechanized farming project in and around the Hawassa area by the Ministry of National Development unless he was guaranteed alternative land for the thousands of Sidama households. Their houses were simply bulldozed without any prior notification and compensation. However, despite his efforts to delay or block the displacement of the Sidama by the emerging city plan and the mechanized farming scheme, the government was not deterred from its intentions and many Sidama were pushed out of the city and its surrounding areas (Dubale 2010). Following the displacement, about four hundred heads of families who served in the war against the Italian aggression from 1936–1941 were brought from Wukro and Korem (northern Ethiopia), Harar (eastern Ethiopia) and Addis Abeba and awarded land to settle in Hawassa. The places they settled still bear the names of their places of origin. In 1960 (1952 EC) the office of the vice district governorate moved from Hawella Tulla to Hawassa. In 1962 (1954 EC) a municipality was founded. 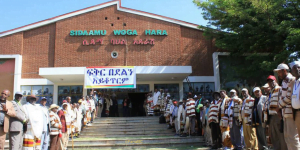 The shift of the political center to Hawassa was not an immediate or easy decision, as there was significant opposition from the landlords in Yirgalem who benefited substantially from having the political center in their city. Initially, when Sidamaland was incorporated into the ‘modern Ethiopian empire’, the political center had been at Hagereselam (85 kilometres from Hawassa); during Ras Desta Damtew’s reign the center shifted to Yirgalem in 1941 (1933 EC). In the brief period of the Italian occupation, the Italians shifted the center to Aposto, a small roadside town located at the entrance of Yirgalem town and along the paved road connecting Addis Abeba and Moyale (Kenya). Finally, the political center shifted to Hawassa in 1968; until the fall of the imperial regime in 1974, it served as a capital of the Sidamo Governorate General (Sidamo Teklay Gizat), which included Sidama, Wolayta, Gedeo, Jemjem, Borena and Arero. In 1974, the Derg military regime established Hawassa as the capital of its Sidamo district (Kifle Hager). Later on during the transitional government Hawassa became a capital of region 8 and soon after as a capital of both Sidama Zone and SNNPRS up until now. Why tense relationship between the Wolaita and the Sidama? For various novices who do not know the area and the relationship between the two ethnic groups, the various media campaigns and reporting might project as if the two ethnic groups are at loggerheads since a time in memorial. To give a perspective, there is no recorded history of conflict between the Sidama and the Wolayta in Hawassa. Hawassa and the Sidama have been accommodating the Wolayta and other ethnic groups peacefully. Growing up in Hawassa I have been observing respectful Wolayta people with whom we have had brotherly relationships, with whom we went to churches, weddings, funerals, ‘eddirs’ and schools. This has been the Wolayta people whom I know and whom I have huge respect and love. My father, a local person who was born in Tumura area (now named ‘Diaspora’ area ) and his younger brother born in then ‘Fara’ area (now Sebategna camp) are moved to Garaha Gando to their other land in Hawella clan territory as their houses and enclosures (Howe) in both areas were bulldozed due to the urbanization process. My parents have witnessed the growth of the city first hand although their memories of their displacement is not pleasant. My father narrates with great respect about Wolayta pioneer evangelists who came to Sidama and latter Hawassa with Norwegian missionaries like Mr. Magre. He recalls the great evangelists like Anjulo Masebo, Kemere from Wolayta (from Fango), evangelist Tanga, evangelist Tona, evangelist Anja and others. These were the first Wolaytas to come to the Sidama land and settled with the Sidama people. Later on through time many people have come from all corners of the country and there has never been any ethnic conflict in the city. Geographically, Sidama and Wolayta share a common boundary around Bilate River which is very far from Hawassa. They have amicable trade relationship and mostly exchange in a market called Dimtu. Whenever minor skirmishes pope up in this area, it would not escalate to other areas, certainly not at all to Hawassa. Rather local elders using traditional institutions resolve their conflict and resume normal life. Hawassa has never been a fault-line of boundary conflict with the Wolayta as it is placed at the heart of a Sidama land. The neighboring ethnic group is the Arsi Oromo. To be more judicious in our analysis, one has to factor in economic reason for the conflict in Hawassa between the Sidama and the Wolayta. Although economic reason by itself is not a reason for conflict, as some argue, even such reasons and such lines of arguments could not hold water. Most Wolayta people who live in Hawassa like any other groups are ordinary Wolayta who try to reason life by their own hard labor. A casual observer could not see the Wolayta as economic threat of the Sidama in Hawassa. The relationship between the two has been nothing but symbiotic in many regards. Psychology is also important in conflict situations. I have been studying the Sidama and I have discussed their various relationships with their surrounding groups. I have not come across any psychological predisposition that invokes conflict with their Wolayta counterparts. Some cultural practices among the Sidama require adults to make raids against their neighbors but such raids never sanction a raid against the Wolayta. Moreover, traditionally the Sidama never do ‘war songs’ or Gerarsa on or against the Wolayta. It shows that there was no psychologically rooted cause of conflict between the Sidama and the Wolayta throughout Sidama and particularly in Hawassa. So if the above were correct or hold some element of truth, then what explains the recent conflict between the two? Also, although there are so many ethnic groups in Hawassa city who are numerically superior to the Wolayta , and even economically stronger than the Wolayta and even geographically contiguous more than the Wolayta, why was the conflict compounded between the two? I posit the grandeur if not the only explanation and candidate to answer the above question is the role of elites and elite politics. Beginning from the early 1990s, due to its new political saliency Hawassa attracted many people from all over the country particularly from various parts of the South as the city later became the political seat. The city started to expand unprecedentedly displacing the local Sidama farmers. It became a political battle ground for elites to control various political offices in Hawassa. In different times there have been land grabs by politicians and their henchmen to consolidate their economic, social and political capital in the city. Fast-forward, juxtaposed with this, the Sidama have been demanding to have their regional autonomy instead of being pigeonholed with the category of SNNPRS. This demand of the Sidama has been used by other southern elites and by some Sidama elites as a rallying cry to go against any Sidama initiatives that aspires own regional status in the federal arrangement. So it has been framed in various ways, particularly in a way to incite fear among non-Sidamas who are living in Hawassa, as if the the Sidama quest for regional status could pose a threat to their very existence. In the continuum of the Sidama demand for regional status, May 24 2002 is monumental for the sake of this discussion. The Sidama came out en masse to make a peaceful demonstration to demand their cause. During that time, the president of the regional state who happened to be from Wolayta and his vice president who happened to be a Sidama warned the demonstrators to abort any plans of demonstrations. Using public (government media), these officials warned the people that if they don’t comply with the order there could be serious consequences. In defiance of the warning, the Sidama people went to Loqqe area where there is a Hawella leader, Clan Gudumale, (8 kms on the outskirts of Hawassa) to draw confidence and resort. After the Loqee gathering, the demonstrators went to the city center and on their way, the security apparatus started shooting on the people with live bullets. Many people were killed and injured. Following that, thousands of Sidama were arrested, many fled the country and no one was held accountable for the shooting and killing of the people; instead the victims have been perpetually persecuted and their views purged. The president was ‘promoted’ to another post in Addis Abeba while his deputy was sent to a foreign country as an ambassador. I would argue, such incident partly contributed to the concretization of the fractious relationship between the two ethnic groups. Since then, most Sidama started thinking that the Wolayta are conspiring to abort the Sidama quest for regional status. Apart from this there is no real or perceived quagmire in the relationship between the two ethnic groups. One could ask why Wolayta only? I submit, based on anecdotal evidences, the inaccurate perception of the Sidama of the Wolayta officials (political elites) as symbolic representation of the Wolayta people have sown suspicion that they were standing on their way for the demand of their regional status. For a general reader, there are more than 56 ethnic groups who are living in Hawassa. Unfortunately, neither the Sidama political elites nor the Wolayta political elites have formally come out and tried to diffuse the tension and suspicion that was building up between the two ethnic groups. Also, the political elites who occupied various government offices have been sowing suspicion, discord, hate and bigotry. They have been burying their heads in hatred and bigotry. Bigotry has been their political fodder to live on. A hate and bigotry rendezvous has been their hallmark achievement that they report to their bosses at the center to get promotion and go through the ranks of government offices. In fact, those officials who successfully engaged in a frivolous pursuit slicing and dicing people have made their way up the ladder of the government. Unfortunately, most of this same people and their henchmen are carried away with their cheap political prattling in social media. Their discourse is filled with dangerous demagoguery and blatant lies about the two great people who have lived peacefully for generations. Furthermore, one important contributing factor behind the transformation in people’s attitude is that the demand of the Sidama people to have their own regional status. No one with sane mind would argue that it is illegitimate and I would not indulge into that sort of notoriety which is too cheap because the demand of the Sidama people according to the Ethiopian constitution is legitimate and legal, which needs to be addressed by granting it. However, one cannot deny the presence of groups who are using this request to incite and even conspire to use the Wolayta as Trojan horses to upset the peaceful co-existence of the Wolayta and the Sidama people. These groups included individuals who were in various privileged positions before the coming of the federal arrangement in 1991 and who have lost their influence due to the various arrangements that came along with the new federal dispensations; many of them have been harboring their disdain for the new approach which in some ways alienated them. Hence, the unsettling of the good relationship. The Social media dissemination of well fabricated information has also empowered demagogues and foster ethnic strife. For example, by using the name of the famous Dinshu Dana, an entertainer, fake social media accounts have posted a divisive and hateful messages until she came out publicly and said that she did not do it and rejected the message in its entirety. She emphasized the close and respectful relationship between the two communities and appreciated the culture of the Sidama where she is brought up. It is important for sober observers to note that the various vilifying messages spreading on social media should not and will not represent the relationship of the two great people. The chorus of hate will get louder when it gets audience and those people who keep silent in times of crisis like this. I urge, all sane minded, peace loving people to stand up and silence the cacophony of hatred and discord. As Burke says, ’Let sanity and common decency take the helm’.